To say that Dagomys is a spring capital of chess Russia will not be a big exaggeration. Since April – children first, and now club championship... The whole country is waiting impatiently for news from Black Sea coast. Having turned from a potential player to a commentator, your author has got an opportunity of more attentive watching events on 64 squares. I shall gladly share many bright impressions with you. I shall not hold on chronological order in this review, yet I shall start with one of the most nice-looking games of the first round in Premier League. 1.e4 c6 2.d4 d5 3.e5 Ґf5 4.¤f3 e6 5.Ґe2 ¤d7 6.O-O Ґg6. Fashionable move order in closed Caro-Kann. Black keeps the opportunity to put his knight on h6. 9.¤e1! A very strong regrouping. The knight gives room to his brother and goes to f4 itself. The idea arose rather lately and it is bringing success to White for the present. 9...c5 10.¤df3 ¤f5 11.¤d3 cxd4 12.cxd4 Ґh5 13.¤f4 Ґxf3 14.Ґxf3 g6N. A new move. 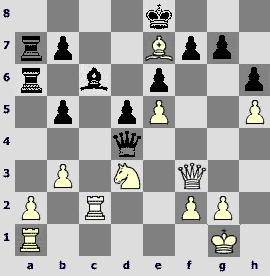 In Areshchenko – Akesson, Dresden 2007, Black chose 14...Јb6, but after 15.Ґg4! Јxd4 (15...¤xd4? 16.Ґe3 Ґc5 17.b4 Јxb4 18.¤d3ќ leads to a loss of a piece) 16.Ґxf5 Јxd1 17.¦xd1 exf5 18.¤xd5 White got the edge in the ending. 15.Ґg4 ¤g7. The retreat of the knight did not justify itself. Maybe 15...O-O!? was worth trying, and if 16.Ґxf5 gxf5 17.¤h5 then strengthening by 17...ўh8 18.Ґh6 ¦g8. 17.g3! A typical method. White opens the h-file to checkmate his opponent. 17...Јc7 18.h4 ¦ac8?! Seems like 'the wrong rook'. 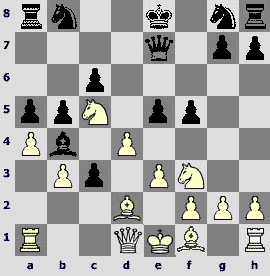 In case of 18...¦fc8 19.h5 ¤f5 it would be more difficult for White to break Black's defence. Besides, 18...h5!? 19.Ґh3 ¦fc8 is possible. 19.h5 Јc4. It seems more logical to try to trade queens by 19...Јc2?, but then 20.Јxc2 ¦xc2 21.hxg6 hxg6 22.¤xd5! Also unsound is 19...¤f5 20.hxg6 hxg6 21.Ґxf5 gxf5 due to 22.g4! 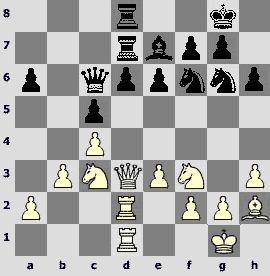 fxg4 (22...Јc2 23.Јxc2 ¦xc2 24.gxf5) 23.¤xe6! (thanks to the rook on f8) 23...fxe6 24.Јg6+ ўh8 25.ўg2, and White wins. 21...¦fd8? I believe it a decisive delay. 21...¤f5? 22.Ґxf5 exf5 (22...gxf5 23.¤h5) 23.e6 is bad but 21...Ґg5! 22.ўg2 Јc2 is significantly stronger keeping the queens exchange in mind. 22.ўg2 Ґg5. On 22...Јc2 prophylactic 23.¤d3! (23.¦h1 Јe4+) would follow and 23...Ґg5 does not help: 24.Јxg5! (24.Јf3 Ґxc1 25.¦axc1 Јd2 26.¦h1 Јg5 is not so clear) 24...Јxd3 25.¦d1 Јe4+ (25...Јc2 26.¦h1) 26.Ґf3 Јf5 27.Јh4 with an overwhelming advantage. 23.¦h1 Јc2 24.Јf3. More quickly decides 24.¤xg6! Јxg6 (24...Ґxe3 25.¦h8#) 25.Јxg5ќ yet after the text move Black needs a good advice. 24...¤f8?Quickens the outcome, however either 24...Ґxf4 25.Јxf4 Јe4+ 26.Јxe4 dxe4 27.Ґg5 or 24...Ґe7 25.¤d3! is hopeless also. Unfortunately, Andrei Volokitin's play did not go so well in next rounds, but it is not finish yet... Now let us proceed to heroes of start and maybe of the whole championship. I hesitate to apply any epithets to creativity of Tomsk team's leader. Simply let us see and continue with Caro-Kann at the same time. 1.e4 c6 2.d4 d5 3.e5 Ґf5 4.¤d2 e6 5.¤b3. Sergey Rublevsky employs the scheme not for the first time. 6...Јc7!? Rather rare move as compared to 6...¤e7. Its idea is to play c6-c5 as soon as possible. 7.Ґd3N. Never played before. 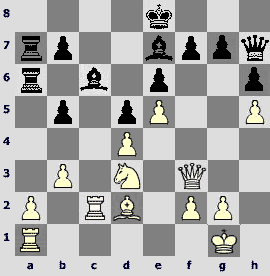 White tried 7.¤h4, 7.Ґe2 and 7.Ґe3. 7...Ґg4! 'Like Chigorin', and maybe 'like Morozevich' already. Black 'disrespects' his bishops. 10...Ґxc5! Continuing the same trend. In case of capture on e5 the play would be quite different. 11.¤xc5 ¤xc5 12.Ґb5+ ¤d7 13.O-O! It is no time to think of defending the central pawn. 13...¤e7. 13...Јxe5?! 14.Ґf4 Јe4 15.Јg3 would be too risky. 14.Ґg5 ¤f5 15.c4. When having two bishops one must open the centre, though 15.Јa3!? is perspective also. 15...h6 16.cxd5 ¤d4. After 16...hxg5? 17.dxe6 fxe6 either 18.¦fd1 or 18.¦ac1 is unpleasant. 17.Јd3!? A courageous and non-trivial decision. Normal 17.Ґxd7+ Јxd7 18.Јe4 Јxd5 19.Јxd5 ¤e2+! (19...exd5 20.¦fd1) 20.ўh2 exd5 21.Ґe3 d4 leads to approximate equality. 17...¤xb5 18.dxe6? Here White had to brake slightly: 18.Ґf4! Јb6 (or18...a6 19.a4 ¤a7 20.¦ac1 Јb6 21.Ґe3!) 19.dxe6 ¤c5 (19...fxe6?! 20.Јg6+ ўf8 21.¦fd1 ¤d4 22.Јe4) 20.exf7+ ўxf7 21.Јf5+ ўg8 22.Ґe3 with unclear consequences. 18...hxg5. Rublevsky hardly relied on 18...fxe6? 19.Јg6+ ўf8 20.Ґe7+! ўxe7 21.Јxg7+±. 19...ўf8! Black beat off, and the material factor begins to prevail. 20.e6 20.Јxb5 ¤xe5 21.¦fe1 ¤xf7µ ¤c5 21.Јxb5 ¤xe6 22.¦fd1 a6 23.Јa4 ¦h4! Another battle unit enters the field. The rest is a matter of technique. It is difficult to understand the next head-breaking game without 'iron friend's' help. 9.¤e4. The new is the well forgotten old. 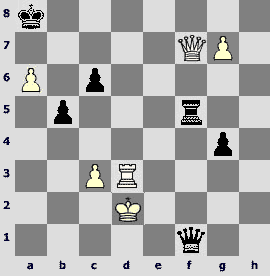 The text move met in Kasparian – Kirillov, Moscow 1931. After 9...f5 10.¤eg5? 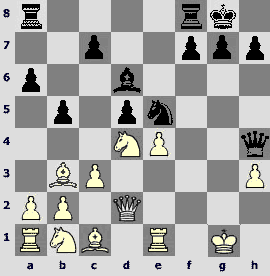 c3 11.¤xe6 Јe7 White had problems. What Alexander kept in his mind? 9...f5. An answer of principle. In case of 9...¤f6 10.¤xf6+ Јxf6 11.bxc4 White is slightly better. 10.¤c5!N. Attacking the bishop and not objecting 10...Ґxc5?! 11.dxc5 ¤d7 12.axb5 cxb5 13.bxc4. 10...c3! Black accepts the challenge. 11.¤xb7 Јe7. Black needs not hurry to capture on d2. 12.¤c5 e5! 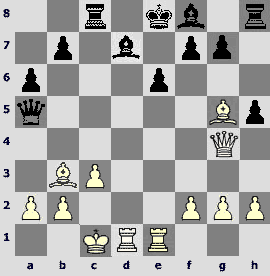 12...cxd2+ 13.¤xd2 Ґxc5 14.dxc5 bxa4 (14...Јxc5 15.¦c1) 15.¦xa4 ¤d7 16.b4 ¤gf6 17.¤c4 is in White's favour. 13.Ґe2?! I need not remind how creative risk is inherent to 'Morozevich's chess'. 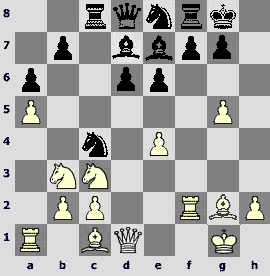 He sacrifices a piece now though he could play 13.Јe2 to have an opportunity to retreat his bishop to c1. No storms after 13...cxd2+ 14.¤xd2 exd4 15.exd4 – there is approximate balance on the board. 13...e4 14.O-O exf3 15.Ґxf3 cxd2 16.axb5 ¤f6 17.bxc6. Absolutely irrational position arose... profitable for Black objectively. 17...¦a7?! Understandable, but 17...¤a6! is much more perspective – Black seems to be better here, for example 18.c7 (18.¤d3 Ґc3; 18.¤d7 ¤xd7 19.cxd7+ ўxd7 20.Ґxa8 ¦xa8) 18...¤xc5! 19.Ґxa8 O-Oµ. 18.¤d3! In order to trade the consolidating bishop b4. 18...O-O?! Better is 18...¤a6 19.¤xb4 ¤xb4 20.Јxd2 O-O with unclear consequences. 20.Јc2! Double attack. The pawn on f5 is hanging and 21.c7 threatens. The balance begins to shift to White's side. 20...¤a6. On 20...Јd6 White has prepared 21.b4!, and if 21...g5!? then 22.b5! (22.Јxf5 g4 23.Ґxg4 ¤xg4 24.Јxg4+ ¦g7 25.Јe2 axb4›) 22...g4 23.Ґe2 ¤e4 24.Ґxg4 fxg4 25.Јxe4±. 21.Јxf5 ¤c7 22.Јc2 ¦b8 23.¦fd1. 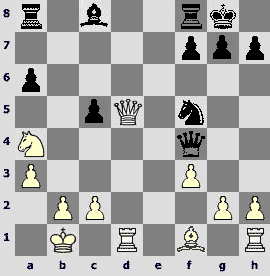 An avalanche of white pawns in the centre is of formidable strength. 23...¤fd5. Neither 23...Јxb3 24.Јxd2 ¤cd5 25.¦dc1 a4 26.e4 ¤c7 27.d5 nor 23...¤cd5!? 24.¦xd2 (24.e4 ¤c3 25.¦xd2 ¤cxe4!) 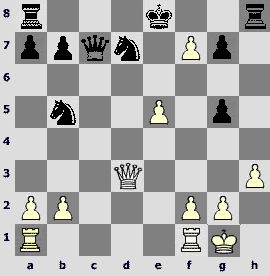 24...Јxb3 25.e4 Јxc2 26.¦xc2 ¤b4 27.¦c4 solves Black's problems. 24.e4. Not wasting time, though capture on d2 was possible. 24...¤c3 25.¦xd2 ¤7b5. On 25...¤e6!? White should have to find 26.d5! 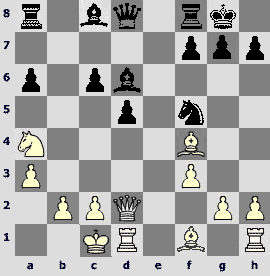 (weaker is 26.¦d3 ¤b5 or 26.¦c1 ¤b5) 26...¤d4 27.Јd3 ¤xb3 (27...¤xf3+ 28.gxf3) 28.¦b2, and the passed pawns must bring win, for instance 28...a4 29.d6 a3 30.c7! ¦f8 31.¦c2! ¤xa1 32.¦xc3ќ. 26.¦c1. 26.¦d3!? seems more accurate, retaining the rook on the a-file. 27...¦xa4. In case of 27...¤xd4 spectacular 28.Јd3 ¤b3 (28...¤xf3+ 29.gxf3 ¤xa4 30.c7) 29.¦xc3 ¤xd2 30.Ґd1!! (30.Јxd2? Јxc3!) 30...Јxe4 (30...¤xe4 31.c7 ¤xc3 32.Јc4+!! ¤d5! 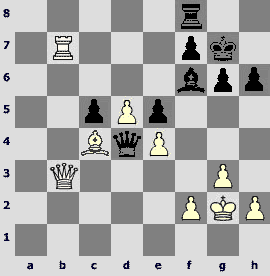 33.Јxb4 ¦xb4 34.c8Ј+ ўf7 35.Јc5 ¦d7 36.Ґc2) 31.Јxd2 follows, and White must win. 28.Ґg4!? Alexander prefers to take the c8-square under control instead of moving his pawns. The latter leads to success also, but the line 28.d5 ¤d4 29.Јd3 ¤b3 30.c7 ¦c8 31.d6! ¤xc1 32.d7! ¦f8 33.Јf1! (defending the 1st rank) 33...¤3e2+ 34.¦xe2 ¤xe2+ 35.Ґxe2 ¦aa8 36.Ґc4+ ўh8 37.Ґa6 is for computer only. 28...Јe7? 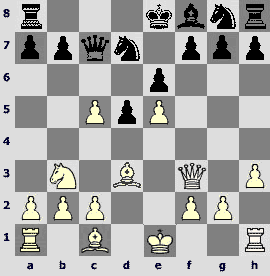 The last mistake, though Black's position is difficult all the same. 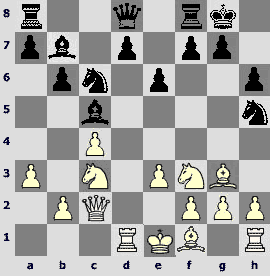 Other defences against 29.c7 might lead to the following exemplary continuations: 28...Јc4 29.d5 ¦ba8 (29...Јxe4 30.c7) 30.h3! ¦a2 31.Јd3 ¤e2+ 32.Ґxe2 Јxc1+ 33.¦d1 Јb2 34.Јxb5 Јxe2 35.Јxe2 ¦xe2 36.d6ќ; 28...¦a3 29.d5 ¦ba8 (29...¤xe4 30.¦b1±) 30.d6! ¤xe4 (30...¤d4 31.c7! ¤xc2 32.d7!ќ) 31.c7 ¤bxd6 32.Ґe6+ ўf8 33.¦xd6 ¤xd6 34.c8Ј+ ¦xc8 (34...¤xc8 35.Јf5+ ўe7 36.¦c7+ ўd6 37.¦d7+ќ) 35.Ґxc8±; 28...¦a7 29.e5 Јc4 30.¦d3±. 29.Јb3+ ўf8 30.¦xc3. Everything is over now. Only Vassily Ivanchuk, playing the first board of Saransk team 'TPS' very confidently, could resist Morozevich's onslaught. Their game became one of the adornments of the championship. 1.e4 c5 2.¤f3 e6 3.¤c3 a6 4.g3 ¤c6 5.Ґg2 d6 6.O-O ¤f6 7.d4 cxd4 8.¤xd4. 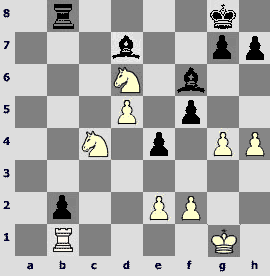 Moves rearranged, 'Scheveningen with g3' arose. 13.g4!?N. 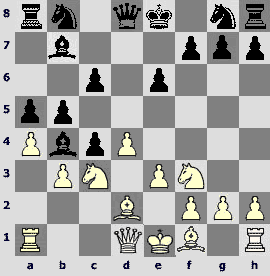 Usually White plays 13.Јe2 first and then in case of 13...Јc7 – 14.g4. 13...h6. A logical reaction. Black allows opening of the h-file after g4-g5, but gets possession of the e5-point. 14.¦f2?! Somewhat artificial, though the rook was not out of job afterwards. Immediate 14.g5!? looks more perspective. 14...¦c8. The alternative is 14...e5! ?, and if 15.f5 then 15...b5. 15.g5 hxg5 16.fxg5 ¤e8. In case of 16...¤h7 17.h4 the knight would be out of play. 17.h4. A straightforward attempt to checkmate after 17.Јh5 will not succeed due to 17...g6 18.Јh6 ¤g7 19.¦f3 ¤h5 20.¦h3 ¤e5 but a question arises: what if White saved a tempo instead of 14.¦f2? 17...g6 18.Ґh3 18.h5?! Ґxg5 19.hxg6 fxg6 20.¦xf8+ ўxf8µ ¤g7 19.¦g2. An opinion exists that White's attack is somewhat baffled. 19...¦e8. A disputable move as concerns the f7-point safety. However Ivanchuk aims at a breakthrough in the centre. 20...d5! Consistently. On 21.exd5 would follow 21...¤f5! 22.Ґxf5 (22.h5 ¤ce3 23.Ґxe3 ¤xe3 24.Јf3 Ґxg5!) 22...exf5 with a good compensation for a pawn. 21.h5 gxh5 22.Ґxh5 d4! Nice and strong. White's strategy is in doubt. 23.Ґxf7+? An incorrect sacrifice. The position after 23.¤xd4 (or 23.¦f2 ¦f8 24.¤xd4 Ґc5) 23...Ґc5! (but not 23...¤xh5? 24.Јxh5 Ґc5 25.g6! Ґxd4+ 26.ўh1ќ) 24.¦f2 ¦f8 is attractive for Black, but White has nothing better. 23...ўxf7 24.g6+ ўg8 25.Јf3. 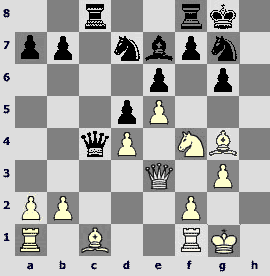 To understand White's idea, let us see a co-operative variation: 25...dxc3 26.Јf7+ ўh8 27.¦h2+ Ґh4 28.Јf4! ўg8 29.¦xh4 ¤e5 (29...¤f5 30.exf5 Јf6 31.Јh6) 30.¦h8+! ўxh8 31.Јh6+ ўg8 32.Јh7+ ўf8 33.Јh8+ ўe7 34.Ґg5+ ўd6 35.¦d1+ ўc6 36.¤d4+ ўc7 37.Ґxd8+ ¦cxd8 38.Јh2ќ. 25...¤e5? 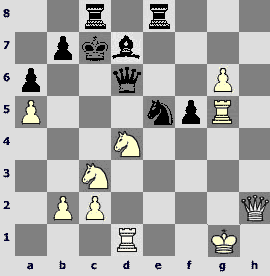 Black defended himself against mate, but there was no hurry. Right is 25...Ґf6! 26.Ґg5 ¤e5! 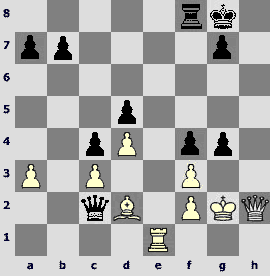 27.Јxf6 Јxf6 28.Ґxf6 ¤f3+ 29.ўf2 ¦f8, and Black must win. 26.Јh3 Ґf6? And this mistake might lose the game. 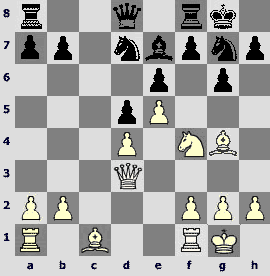 In case of 26...¤xg6 27.¦xg6 dxc3 White must force perpetual check: 28.¦xg7+! ўxg7 29.Јh6+ ўg8 (after 29...ўf7? 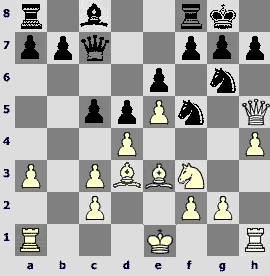 30.Јh7+ ўf6 31.e5+!ќ checkmate in all variations) 30.Јg6+=. Besides, 26...Ґh4 27.¤xd4 ¦c5!? is interesting. 29.Ґg5! Morozevich's attack seems unstoppable. 29...ўd6! A flight to the queenside is the best chance. 29...Ґxg5 30.¦xg5 ўd6 31.¦xe5ќ. 30.Ґxf6 Јxf6 31.¦f1 Јe7 32.¦d1! Very accurately. Black will have to return a piece soon. 32...ўc7 33.Јh2! Јd6 34.¦g5 ¤f5 35.exf5 exf5. The storm ceased slightly, yet the position is strained. Objectively, White wins but he needs to be extremely attentive about his exposed king. 36.Јf4?! White should fully use the passed g-pawn: 36.g7! ўb8 37.Јg3 ¦g8 38.¤xf5ќ. 36...ўb8 37.g7 ўa8. The black king feels comfortably now, contrary to his white colleague. 38.¦g3. Computer insists on 38.ўg2!? 38...Јc5 39.ўf1?! And here 39.b4! Јxb4 (39...Јc4 40.¤de2) 40.¤d5 Јxa5 41.¤f6ќ was good. 39...¤g4! Black obtains his own trumps. 40.¦dd3? Right way is lost. 40.¦gd3 is stronger. 40...Јe7 41.ўg2 ¦c5. 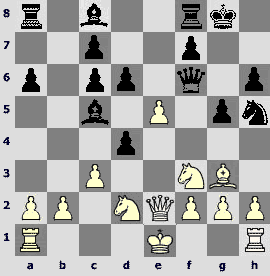 Preventing knights' jumps onto the rank 5, but it was more reliable to eliminate the impertinent pawn: 41...Јxg7 42.¤d5 ¦c5 ( 43.¤c7+? ¦xc7 44.Јxc7 Ґc6+) or 42.¤xf5 Јh7! 42.b4? Turns out to be a fatal mistake, moreover, Morozevich misses a tempting opportunity again: after 42.¦de3! ¤xe3+ 43.Јxe3 ¦e5 (43...Јxe3?! 44.¦xe3 ¦g8 45.¦e7 is risky) 44.¤d5! ¦xe3 45.¤xe7 ¦3xe7 46.g8Ј ¦xg8 47.¦xg8+ ўa7 the game would rather end in a draw. 42...¦e5 43.b5 axb5 44.Јf3 ¦c5!? A concrete approach. Prophylactic 44...ўa7 is also possible. 45.¤d5? The last miss. However, after 45.a6 Ґc6 46.¤xc6 bxc6 47.¦xg4!? (47.Јd1 Јxg7) 47...fxg4 48.Јe4 Јf7! (48...Јxe4+? 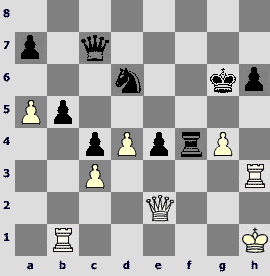 49.¤xe4 ¦xc2+ 50.ўg3=) 49.Јxg4 ¦g8 Black wins also. 45...¦xd5! A simple tactical stroke. 46.a6. Immediately loses 46.Јxd5? Ґc6 47.¤xc6 Јe2+. Only 46.¦xg4 ¦xd4! 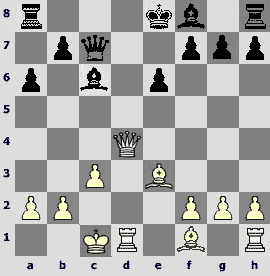 47.¦gxd4 Ґc6 48.¦d5 Јxg7+ might prolong White's resistance. 46...Јc5 47.c3 Ґc6 48.¤xc6 bxc6. Black is a piece up, but Morozevich is very resourceful. 54...¦xf7. White cannot defend his king. Other team members are doing their best to allow 'Tomsk-400' to show extraordinary results. 1.e4 e6 2.d4 d5 3.¤c3 dxe4 4.¤xe4 ¤d7 5.¤f3 ¤gf6 6.¤xf6+ ¤xf6 7.c3!? A similar interpretation of French with 3...dxe4 has become popular after Kasparov's victory over Ponomariov in Linares 2002. 7...c5 8.Ґe3 Јc7 9.¤e5 a6 10.Јa4+ ¤d7 11.O-O-O cxd4 12.¤xd7 Ґxd7. 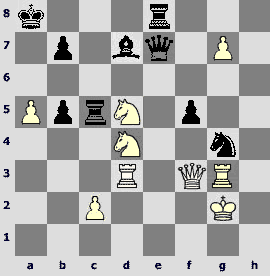 In Anand – Adams, Linares 2002, White gained slight advantage after 12...Јxd7 13.Јc2 Ґc5 14.Ґxd4 Ґxd4 15.¦xd4. 14.Ґc4!? 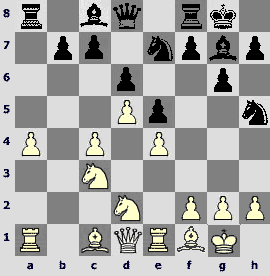 The e6-point is a vulnerable place in the opponent's position. 14...¦d8 15.Јg4 Ґd7?!N. A novelty of doubtful value. I wonder what Sergey Karjakin had prepared on 15...h5, the move that Bareev employed successfully against Anand (Monte-Carlo 2004) and Ponomariov (Poikovsky 2006). 16.Ґb3 Јa5 17.Ґg5! Black has a hard position. 17...¦c8 18.¦he1 h5? 18...¦c6 at least does not lose immediately, though after 19.Ґh4! it is difficult to find a move for Black. 19.Ґxe6! A simple tactical stroke ends the game. 11...¤xe5?! The ancient Breslavl variation connected with a piece sacrifice. 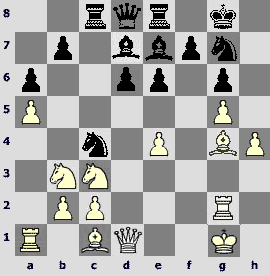 To play it in the computer epoch against Pavel Smirnov is dangerous or even venturesome. 12.f3 Ґd6 13.fxe4 Ґg4 14.Јd2 Јh4 15.h3 Ґxh3?!N. Not very lucky novelty. Also insufficient is 15...¤d3 16.¦e3 dxe4 17.¦xe4 Јg3 18.Јe3 Јh2+ 19.ўf1 Јh1+ 20.Јg1ќ. 15...c5 is the best move (Dr. Siegbert Tarrasch played so as long ago as 1923), but playing accurately White gets the upper hand: 16.¦e3!? dxe4 (16...cxd4 17.cxd4 ¤c4 18.Ґxc4 dxc4 19.e5±) 17.¤xb5 axb5 18.Јxd6 ¤d3 19.hxg4 Јf2+ 20.ўh2 ¤xc1 21.Јd2±. 16...¤d3? A surely losing move. 16...c5! 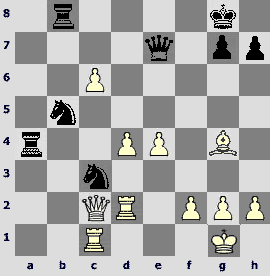 is stronger but 17.¦e3 must gradually extinguish Black's activity. 17.¦f1 dxe4 (17...¤xc1 18.Ґxd5ќ) 18.Јg5 Јxh3 19.Јg2. Two extra pieces clearly surpass formidable Black's pawns. 19...Јh5 20.Ґe3 ¤e5 21.¤d2 ¤g4 22.Ґf4 e3. Ends the game immediately, but it is difficult to offer anything better. By the middle of the tournament it became quite clear that only champions of Russia is able to compete with champions of Europe. 'Ural' has his own goalscorer – Alexander Grischuk. 1.e4 e5 2.¤f3 ¤c6 3.Ґb5 a6 4.Ґa4 ¤f6 5.Јe2 Ґc5 6.d3 d6 7.c3. Up to now Sergei Tiviakov defended this modest scheme successfully. 9...g5!N. Grischuk demonstrates the most radical method of struggling against diagonal pin being perfectly ready to his opponent's breakthrough in the centre. 10.Ґg3. A sacrifice on g5 is obviously out of place. 10...¤h5 11.¤bd2. 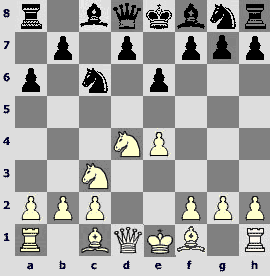 In case of 11.Ґxc6 bxc6 12.d4 exd4 13.cxd4 Ґb6 Black has the edge because White's central pawns are weak. 11...Јf6! Black obtained nearly ideal arrangement of his pieces, and White, of course, does not want to bear it. 12.Ґxc6 bxc6 13.d4?! White, unwillingly, helps Black. Still I do not want to recommend passive moves. 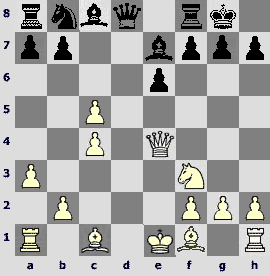 Probably, the cause of White's failure lies in the opening line choice. 13...exd4 14.e5. 14.cxd4 ¤xg3 15.hxg3 Ґxd4 16.¤xd4 Јxd4 17.¦xh6 (17.Јh5 Јxb2 18.¦b1 Јf6) 17...Јxb2 18.¦b1 Јg7 leads to a pawn loss. 14...d3! A clear refute of White's idea. 15.Јxd3 Ґf5! Pair of black bishops is a terrible force. 16.Јxa6. 16.exf6 Ґxd3 or 16.Јc4 Јg6 is not better. 16...¤xg3 17.hxg3. After 17.exf6 ¦fe8+ 18.ўd1 ¤xh1! there is no hope for White, and on 17.Јxc6 the most simple is 17...Ґxf2+! 17...¦xa6 18.exf6 ¦e8+ 19.ўd1 (19.ўf1 Ґd3+ 20.ўg1 ¦e2°) 19...Ґxf2 20.¤d4. 20.¦xh6 g4° loses immediately. 20...Ґxd4 21.cxd4 ўh7. Now White cannot defend all his weaknesses. 24...¦b4! Alexander Grischuk wins a pawn and then the game soon. 6.f3. 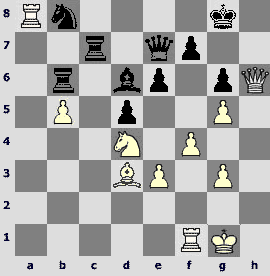 White tends to a long castling but through a rare move order. With the pawn on f3 he may carry out g2-g4 earlier. As the result Andrei Volokitin gives up developing his knight on f6 and plays in the centre immediately. 6...d5 7.exd5 exd5 8.Ґe3 Ґb4 9.Јd2 ¤ge7 10.O-O-O!?N. 10.a3 Ґa5 11.¤b3 met in Pikula – Kontic, Pancevo 2006. 12.¤xc6!? A non-trivial idea. 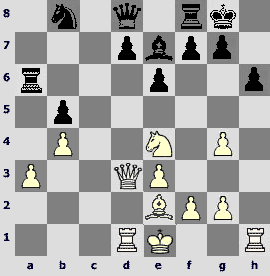 White turns an isolated pawn into c6-d5 pair and begins struggling for dark squares. 12...bxc6 13.¤a4 ¤f5. A logical reaction. 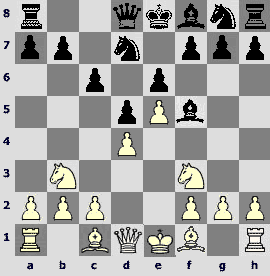 After 14.Ґc5 Ґxc5 15.¤xc5 Јd6 it would be difficult for White to keep blockade on c5. Do not forget weakness of the e3-point too. 14...c5?! A crucial move bringing troubles to Black. 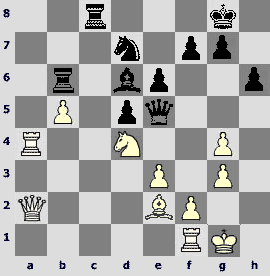 Perhaps on 14...Ґxf4 15.Јxf4 ¦e8 Grischuk was going to play 16.Ґd3! ¤e3 17.¦de1 ¤xg2 18.¦xe8+ Јxe8 19.Јg3 Јe3+ (19...¤e3? 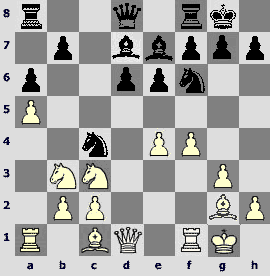 20.¤b6 ¦a7 21.Јb8) 20.ўb1 Јd4 21.Јc7 reaching the pawn on c6. Restrained 14...¦b8!? or 14...¦e8!? is worth attention. 15.Ґxd6 Јxd6 16.Јxd5 Јf4+. 16...Јh6+ 17.ўb1?! 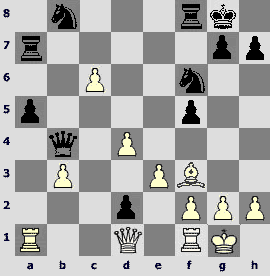 ¤e3 18.Јxa8 ¤xd1 followed by 19...¤f2 is acceptable for Black, but stronger is 17.Јd2 with an extra pawn. 17.ўb1! In case of 17.¦d2 Ґe6 18.Јe4 Јh6 threatens 19...¤g3. 17...Јxa4?! More hopes gives 17...¤e3 18.Јxa8 (18.Јd2?! Ґf5©) 18...¤xd1 19.Јe4 (else 19...¤f2) 19...Јxe4 20.fxe4 ¤f2 21.¦g1 ¤xe4 22.Ґd3 Ґd7 23.¦e1!, though in this ending White has clear advantage also. 18.Јxa8 ¤e3 (18...¤d4 19.Ґd3±) 19.Ґd3. A reliable way but 19.¦d2!? Јa5 (19...¤xc2 20.Јd5) 20.ўc1 ¤xc2 (20...c4 21.Јe4 c3 22.Јxe3 cxd2+ 23.Јxd2) 21.Јe4 ¤d4 22.Ґc4 is good too – White stabilizes the situation and then the extra material will decide. 19...Ґf5 19...¤xd1 20.¦xd1 Јh4 21.Јc6 Јxh2 22.Јxc5±. 20.Јxa6! 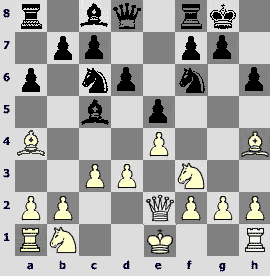 The game forces to an endgame with big positional advantage on White's side. 20...Јxa6 21.Ґxa6 Ґxc2+ 22.ўc1 Ґxd1 23.¦e1! 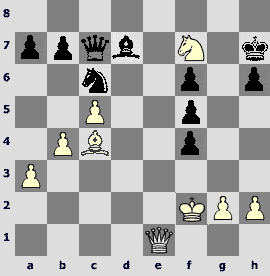 The piece is regained and then White's rook and bishop dominate the opponent's rook and knight. 23...Ґxf3 24.gxf3 ¤f5 25.¦e5 ¤d4 26.Ґc4 ¤e6. If 26...¦c8 then 27.¦e7, and in case of 26...¤xf3 White has intermediate 27.¦f5!, because in the line 27...¤xh2? 28.Ґe2! the knight is trapped. 30.Ґxe6. Transition to the technical stage. 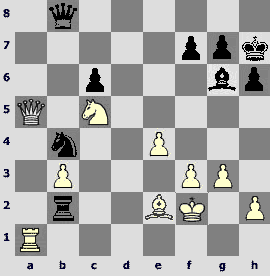 Black has no chances to escape in a rook ending. 30...fxe6 31.¦xe6 c4 32.¦e4 cxb3 33.ўxb3 ¦h5 34.h4 ¦f5 (34...g5 35.hxg5 ¦xg5 36.ўb4ќ) 35.f4 ¦h5 36.ўb4 ¦xh4 37.a5. Black obviously has no time for counterplay at the kingside. The passed a-pawn brings win to White. 'Elara' of Cheboksary has mighty staff. Experienced fighters do not let the team down, the following two games being the evidence. 10...¤c6. 10...Ґxc5 is more frequent, but then White plays 11.b4 with a tempo. Now on 11.b4 will follow 11...f5! with good counterplay. 11.Ґf4!N. A deep idea by Boris Gelfand. 11...Ґxc5?! 11...f5!? was worth attention, but it was difficult for Black to foresee the following events. 12.¦d1! Јb6. 12...Ґxf2+ 13.ўe2 (not 13.ўxf2? Јxd1 14.Ґd3 f5!) 13...Јb6 14.b4 cannot change anything. 13.b4! Ґxf2+ 14.ўe2. 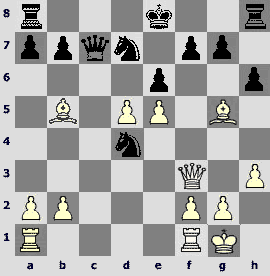 White threatens with 15.c5 – Black must take measures. 14...f5. Head-breaking 14...e5!? 15.c5 Јc7 16.¤xe5 Ґh4 17.¤d7! Јd8 (17...Јxd7 18.¦xd7 Ґxd7 19.ўd2 ¦fe8 20.Јd5±) 18.¤xf8 Ґg4+ 19.ўe3 Јxd1 (19...Ґxd1? 20.Јxh7+ ўxf8 21.Јh8+ ўe7 22.Јxh4+ќ; 19...Јxf8 20.Ґd6 Јe8 21.¦d5 Ґf2+ 22.ўf4 Ґe6 23.Ґc4±) 20.Јxh7+ ўxf8 21.Јh8+ ўe7 22.Јxh4+ ўd7 (22...f6 23.ўf2! 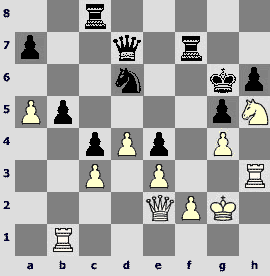 Јc2+ 24.ўg1) 23.Ґd3 Јxh1 24.Јxg4+± with eventual 25.Ґf1 is still in favour of White. 15.Јc2 e5. Interesting but still insufficient is 15...¤d4+!? 16.¤xd4 Ґxd4 17.c5 Јb5+ 18.ўe1 Јe8! (18...Јd7 19.Ґd6) 19.¦xd4 e5 in view of 20.Ґb5! Јxb5 21.Јb3+ ўh8 22.Ґxe5. Further, for instance, 22...¦e8 23.Јg3 ¦xe5+ 24.Јxe5 Ґd7 25.ўf2 ¦e8 26.a4! Јxa4 27.Јf4± is possible. 16...Јc7?! 16...Ґxc5 17.bxc5 Јc7 does not bring sufficient compensation for a piece but gives chances to fish in troubled waters. 17.ўxf2 exf4 18.Ґc4+ ўh8 19.Јc3 Ґd7 20.¦he1. 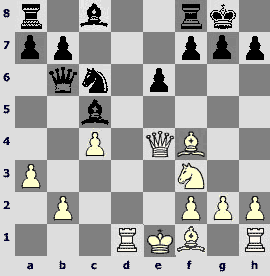 The ideal co-ordination of white pieces becomes a decisive factor. Black cannot hold his ground. 20...¦ae8 21.¦d6 ¦xe1 22.Јxe1 ¦f6. Or 22...¦e8 23.Јd2 Ґc8 24.Јxf4 ¦e4 25.Јc1. 26.Јd1! The queen goes to h5. 26...Јc8. Hoping on 27.Јh5 Јf8 but in vain. 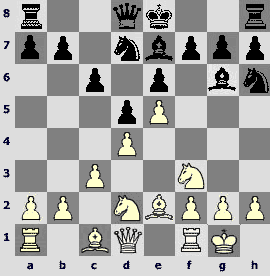 However, other moves are not helpful: 26...Ґe8 27.¤d6; 26...f3 27.g3! ; 26...b5 27.Ґb3; 26...¤e5 27.¤xe5 fxe5 28.Јd5. 1.d4 ¤f6 2.c4 e6 3.¤c3 Ґb4 4.Јc2 c5 5.dxc5 O-O 6.a3 Ґxc5 7.¤f3 b6 8.Ґf4 Ґb7 9.¦d1 ¤c6 10.e3 ¤h5 11.Ґg3 h6. This move order met already in Dmitry Jakovenko's practice. 12.Ґe2 ¦c8 13.Јd3!?N. It is more perspective than 13.Јd2 played earlier. 13...¤xg3 14.hxg3 ¤b8 15.g4! Trying to make use of castling delay and of the queen position on d3. Now 16.g5 is threatening. 15...Ґe7 16.¤b5. Sticking to the opposite side also. 16...Ґa6?! Simplifications are not fully justified in 'hedgehog' structures. Further course of the game confirms it to a certain degree. The most of principle continuation is 16...d5!? with the idea on 17.cxd5 (17.¤xa7 ¦xc4) to answer 17...Јxd5 18.Јxd5 (18.¤xa7? Јa5+) 18...Ґxd5 19.¤xa7 ¦c2 with active counterplay. 17.¤fd4 Ґxb5. Now on 17...d5 strong is 18.Јb1! 18.¤xb5 a6 19.¤d6 ¦c6. Jakovenko stakes on the fastest b6-b5. Another way is 19...Ґxd6 20.Јxd6, and then either to 'suffer' after 20...Јc7 or to choose active 20...¤c6!? 21.Јxd7 Јf6. 20...b5!? On 20...d6 unpleasant is 21.f4 threatening with 22.g5. 21.cxb5. Evgeny Bareev fixes the black pawn on d5, yet 21.c5! f5 (21...Ґxc5 22.g5!) 22.gxf5 exf5 23.¤g3 ¦xc5 24.b4 ¦e5 25.f4 Ґh4 (25...¦e6 26.¤xf5) 26.fxe5 Ґxg3+ 27.ўf1 seems more clear – Black hardly has sufficient compensation for the exchange. 21...axb5 22.b4. 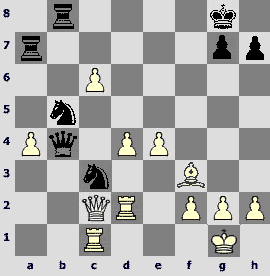 In case of 22.Јxb5 ¦b6 23.Јe5 ¤c6 24.Јc3 d5 Black have a good play. 22...¦a6. 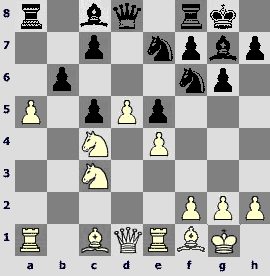 A counterattack on the pawn on a3 allows holding balance. 23.O-O. If 23.Јb3 Јb6 24.¤c3 then 24...Јb7!, and only White risks in the line 25.Ґxb5?! Јxg2 26.Ґxa6 Јxh1+ 27.Ґf1 Јc6. 23...Јb6 24.Јb3. After 24.¦a1 Јa7 White still has no better move than 25.Јb3. 24...Јa7 25.¦a1 ¦b6. More accurate is 25...Јb7! 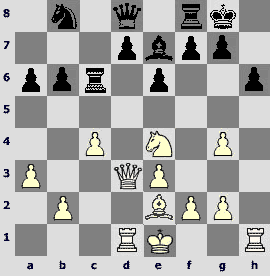 26.¤c5 (26.¤c3 ¦b6) 26...Ґxc5 27.bxc5 ¦a5, not permitting a passed pawn to appear. 26.a4! bxa4. 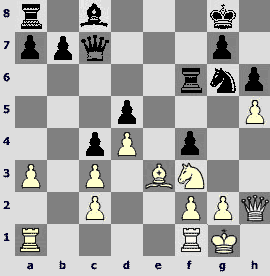 In case of 26...Јb7 27.a5 ¦c6 28.¤c3 Ґf6 (28...¤a6 29.¤xb5 ¤xb4 30.¤d4) White has 29.¤xb5! Ґxa1 30.¦xa1©. 27.¦xa4 Јc7 28.b5 d5 29.¤d2! The knight moves to the next central square. 29...¤d7 30.Јa2 ¦c8 31.¤b3 Јe5 32.¤d4. 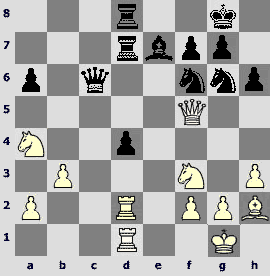 White has minimum advantage, but Jakovenko decided to play too aggressive here. 33...¦c3?! Turns out to be a blank shot. 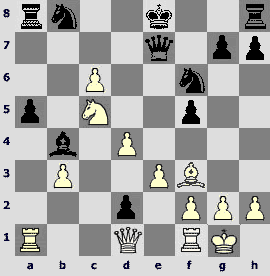 After quiet 33...Јf6 it is difficult for White to strengthen his position. 34.¦a8+ ўh7? A crucial mistake. The bishop must hide the king. 35.Јd2! Fortifying the e3-point and preparing fearful f2-f4. 41.Ґxg6! The final attack is fine though elementary. Members of teams solving modest tasks also have something to boast of. 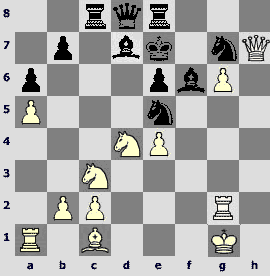 In the start game Sergey Iskusnyh ('Shatar', Buryatia) outplayed formidable Viorel Bologan in the latter's favourite King's Indian. 1.d4 ¤f6 2.c4 g6 3.¤c3 Ґg7 4.e4 d6 5.¤f3 O-O 6.Ґe2 e5 7.O-O ¤c6 8.d5 ¤e7 9.b4 ¤h5 10.¦e1 a5 11.bxa5 ¦xa5 12.¤d2 ¤f4 13.Ґf1 ¦a8 14.a4 ¤h5. Viorel Bologan is a big expert in this system. 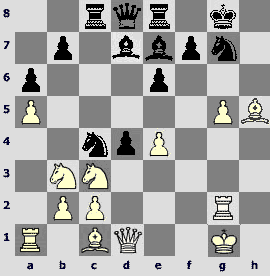 This move order he employed successfully in the recent game versus Werle, Wijk aan Zee 2007. 15.c5!N. Most logical. 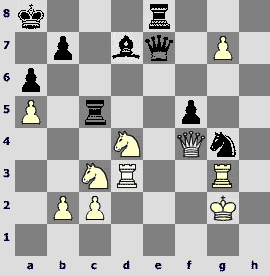 In Werle – Bologan they played 15.Ґa3 c5. 15...dxc5 16.¤c4 b6?! 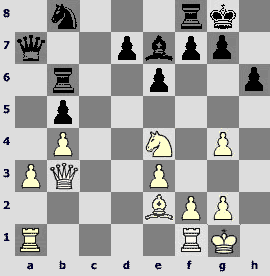 I am not sure White is much better here, yet it is easier for him to play such a position. 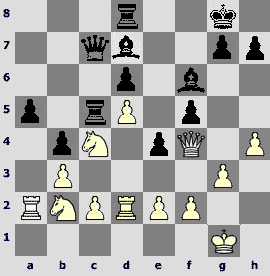 The last Black's move helps White in developing initiative at the queenside, but what instead? 16...f5!? has its own flaws but fits King's Indian better. 17.a5 ¤f6. On 17...Ґd7 unpleasant is 18.d6 cxd6 19.¤xb6. 18.Ґg5!? An interesting interpreting of the position. 18...Ґb7 19.¦b1 ¤c8 20.¤a4. A proper refuse of 20.f4 h6 21.Ґxf6 Јxf6 22.fxe5 Јg5, but 20.¤xe5!? was nice-looking. 20...h6 21.Ґxf6 Ґxf6 22.axb6 cxb6 23.¤axb6. 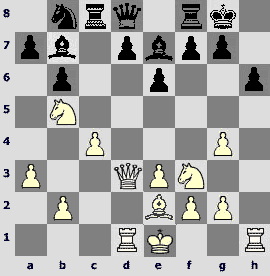 White regained the pawn and he got the defended passed pawn in the centre, the opponent lacking of counterplay. 23...¦a7 24.Јb3 ўg7 25.¦a1 Ґa6 26.¤xc8. Forcing transition to a favourable endgame with opposite-colour bishops and active major pieces. 26...Ґxc4 27.Ґxc4 ¦xa1 28.¦xa1 Јxc8 29.¦a7 Јb8 30.¦b7 Јa8 31.g3 Јa1+. The d5-d6 threat leaves no choice for Black. 33.Јc2! A smart trick unsolved by the experienced opponent. 33...h5? Also bad is 33...¦a8? 34.d6! Јxd6 35.¦xf7+ ўh8 36.Јb3 ¦f8 37.Јb7 ¦xf7 38.Јxf7ќ. Only 33...Ґg5! permits to continue struggling. Grandmaster Evgeny Alekseev of St. Petersburg shows brilliant performance lately. He heads 'Economist' of Saratov here in Dagomys. 1.e4 e6 2.d4 d5 3.¤c3 Ґb4 4.e5 ¤e7 5.a3 Ґxc3+ 6.bxc3 c5 7.Јg4 O-O 8.Ґd3 ¤bc6 9.Јh5 ¤g6 10.¤f3 Јc7 11.Ґe3 ¤ce7. Smbat Lputian has great experience in French Defence, and he used to play this line too. 13.O-O!?N. A novelty. Usually White plays 13.g4 or 13.Ґd2. 13...c4. 13...f6 14.Ґxf5 exf5 15.exf6 ¦xf6 16.dxc5 with pressure on dark squares is in White's favour. 14.Ґxf5 exf5 15.Јg5! f6. Counteraction to the side pawn moving forward is necessary, but the text move leads to the e5-point weakening. 15...¤e7 16.h5 h6 17.Јg3 ўh8 with a slightly worse but solid position was worth attention. 16.exf6 ¦xf6 17.h5 h6 18.Јg3 f4. After 18...Јxg3 19.fxg3 ¤e7 20.¤e5 White has pleasant ending. 19...Ґg4? Unjustified optimism leading to a loss. In case of normal 19...¤e7 20.Ґd2 ¤c6 21.¦fe1 White is only slightly better. 20.hxg6 Ґxf3 21.gxf3. Black has no time to create real threats, as White is a piece up. 21...¦af8 22.¦fe1 Јd6 23.Ґd2 ¦f5 24.ўh1 Јxg6 25.¦g1. Black's plan evidently failed. 25...¦g5 (25...Јf7 26.¦g4!ќ) 26.¦xg5 hxg5 27.ўg2 g4. 27...Јxc2 28.¦h1 Јxd2 29.Јh7+ ўf7 30.Јf5+ does not help. 29.Јh5! Returning an extra piece to proceed to checkmating attack. In the end let us see several curious fragments, mostly tactical. 28.Јxd6. Nothing else, all the same. 28...Јxd6 29.¤xd6 ¦xc2! 30.¦xc2 axb3. A nice-looking etude double attack. 31.¤bc4 bxc2 32.¦xc2 b3. 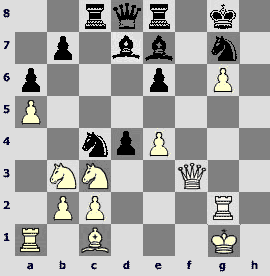 The passed pawn supported by pair of bishops ensures Black's win. 35...Ґa4! White has to give away a piece. The position is absolutely equal. It looks like nothing foretells a storm. 23...d5! A beginning of an impressive march of the d-pawn. 24.cxd5 exd5 25.Јf5? 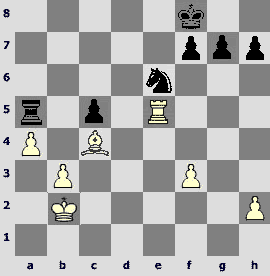 A pseudo-active move to become the cause of White's loss. At the moment it is very difficult to feel the danger hiding in the... 1st rank weakness. 25...d4! Due to tactical motives Black saves the pawn and gets the upper hand. 26.exd4. 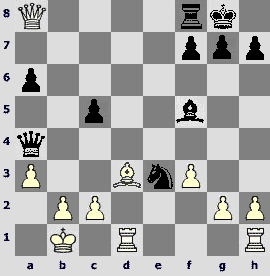 In the line 26.¤e2 dxe3 27.¦xd7 ¦xd7 28.¦xd7 exf2+ 29.ўxf2 ¤xd7 White is a pawn down. 26...cxd4 27.¤a4?! Better was to search for chances after 27.¤e2 d3 28.¦xd3 (loses 28.¦c1? dxe2 29.¦xc6 ¤h4!) 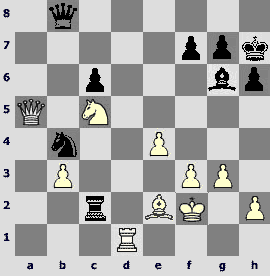 28...Јc2 29.¤ed4 ¦xd4 30.¤xd4 ¦xd4 31.Ґg3 hoping for rook versus two knights. 27...d3! White rooks are restricted and the queen cannot return to his camp – this is a crucial factor. 28.¤b2 ¦d5. 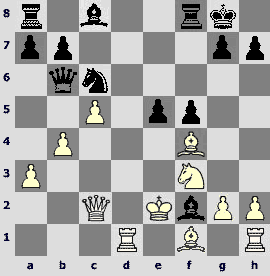 Jobava makes use of bad position of White's queen. Alternatives: 28...Ґb4 29.¦xd3 ¦xd3 30.¤xd3 Јc2°; 28...¤e4 29.¦xd3 ¦xd3 30.¤xd3 ¦xd3°. 29.¤e5. 29.Ґe5 Ґd6 30.¤c4 Ґxe5 31.¤cxe5 (or 31.¤fxe5 Јc5!°) 31...Јb5!° would not change the outcome. Sluggish Caro-Kann movements of pieces turn to unexpected fight. 35...Јe4 36.Ґxe7! 36.Јxe4 dxe4 37.¤c5 led to boring equality. 36...Јxd4? 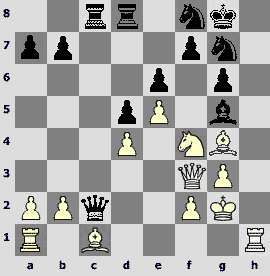 Black is caught by arranged network, though 36...Јxf3 (or 36...ўxe7 37.Јxe4 dxe4 38.¤b4) 37.gxf3 ўxe7 38.¤b4 is in favour of White also. 37.Ґc5! Јxa1+ 38.¦c1 Јxa2 39.Јg4! An attack along dark squares brings win. Black is defenceless. 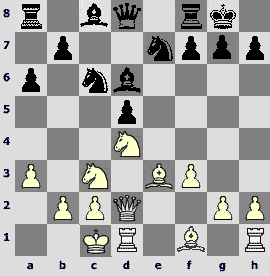 A curious tailpiece of the following game reminded Karpov vs Kasparov rivalry. How to realise an extra pawn most simply? 34.¦d1?! Clearly wins 34.¦a4! ¤c2 (34...¤d5 35.exd5 Јe5 36.¤e4 cxd5 37.¤d2; 34...Јc8 35.Јxb4 Јh3 36.ўe3 Јxh2 37.Јe1) 35.Јc3 Јb6 36.Јxb2 Јxc5+ 37.ўg2 ¤e3+ (37...¤e1+ 38.ўf1) 38.ўh1, but in this case the fragment would be out of our sight. 34...¦c2? In case of 34...¦a2 35.¤d7 ¦xa5 36.¤xb8 struggle might have been prolonged, but the a2-square seems to be intended for a knight, not rook. A duel with non-fading Viktor Korchnoi turned out to be less successful for Artem Iljin. 32.ўh2! A crafty positional trap based on concrete details of the position. 32...¦cf8? This natural moves turns out to be a blunder. Most likely, Artem simply missed the next move. Stronger is 32...Јe6 or 32...ўh7 with complicated struggle. 33.f4! White has solved all his problems (33...exf3? 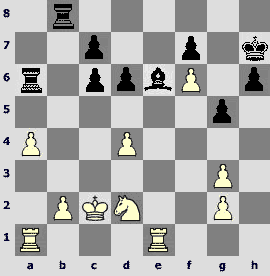 34.Јc2+ќ), and Black acts unsuccessfully again. 33...Јc7? An unnecessary move. Black has no time to capture on a5 all the same; besides, the next move by White is a part of his plan. 33...ўh7 was a must. White would continue 34.ўh1! as in the text, keeping initiative. 34.ўh1! King's manoeuvres are rather funny. Now an ideal place for the queen is cleared out. 34...gxf4?! Hastens the outcome, but there is no escape already. For instance 34...Јxa5 35.f5+ ўh7 36.Јh2! 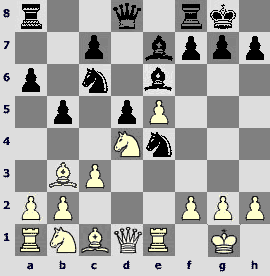 Јb6 (36...Јa6 37.Јe5 Јa3 38.Јe6) 37.Јe5 with many threats, mostly strict of them is 38.¤g7! ¦xg7 39.Јe6! (even stronger than 39.¦xh6+). 37.¦xh6+! A bit of tactics in the end. Let us hope that rest rounds of the championship will not be less interesting in spite of high strain. I feel guilty to participants of women championship. And still there is Higher League... Well, I shall try to correct myself and to eliminate the discrimination in the next part of my review.